The Trump administration is easing environmental regulations and opening up territory for drilling as part of the president’s bid to unleash the “vast energy wealth” of the U.S. Yet Donald Trump’s push to rewrite the North American Free Trade Agreement could have the opposite effect. As NAFTA negotiations resume Friday, oil industry leaders are desperate to preserve the 23-year-old trade deal that drove a North American oil and gas renaissance and paved the way for $34 billion worth of energy exports to Canada and Mexico last year. “Any changes that disrupt energy trade across our North American borders, reduce investment protection or revert to high tariffs and trade barriers that preceded NAFTA could put at risk the tens of millions of jobs,” said the top oil and gas trade groups from the U.S., Canada and Mexico in a joint position paper released last month. Energy companies that sat on the sidelines during other recent trade negotiations are getting more involved on NAFTA — securing formal roles on committees advising the process, unleashing lobbyists to influence it and outlining their priorities for the administration. Armed with a modest wish list, the industry is mostly in a defensive posture, terrified Trump will torpedo the current deal or weaken existing provisions that allow investors to sue countries for discrimination, seizures and other injustices. Trump has raised the possibility of an American exit from the deal at least three times since negotiations began last month. “You may not necessarily be in the crosshairs, but if you don’t maintain a focus on it, you could be collateral damage,” Stephen Comstock, the American Petroleum Institute’s director of tax and accounting policy, said in an interview. When NAFTA was signed almost a quarter-century ago, the U.S. was importing roughly half of its daily oil and petroleum needs. Canada’s oil sands — now churning out 2.4 million barrels of crude a day — were just getting started. And Mexico still had a monopoly on its own energy development, blocking foreign businesses from drilling or processing oil in the country. NAFTA facilitates the duty-free trade of gasoline and other energy products. It also serves as the legal pathway for rising gas sales to Mexico — 4 billion cubic feet a day last year, or about 60 percent of U.S. natural gas exports. Because Mexico is a free-trade partner, natural gas exports to the country qualify for liberalized treatment under a U.S. law. So far, North American oil and gas groups are collaborating, linked arm in arm as they advocate the same broad portfolio of changes. One possible exception: efforts by U.S. oil and gas interests to ensure any new trade agreement locks in recent reforms opening up Mexico’s energy market for foreign investment. U.S. companies are increasingly intertwining their operations with activity on both sides of the border. Chevron Corp., which has a representative cleared to serve on an energy-focused committee of Nafta advisers, stressed in comments filed with the federal government that its supply chain extends across North America. Chevron relies on manufacturers in all three countries to provide equipment, parts, repair services and chemicals. “Disrupting these supply chains would directly harm U.S. businesses,” the company warned. In Mexico, U.S. businesses captured five of the eight deep-water oil and gas blocks awarded during December 2016 bidding. Andeavor, formally Tesoro Corp., just opened its first ARCO-branded filling station in northwestern Mexico — with plans for more as the company leverages refineries in El Paso, Texas, and Los Angeles to provide fuel while using newly contracted pipeline capacity to transport it. For companies with commercial interests in Mexico, the status of NAFTA negotiations is vital to managing bilateral relations, said a lobbyist for an oil company with Mexican operations who asked for anonymity amid private negotiations. The stakes are even higher for the energy sector given the constitutional reforms in Mexico, the lobbyist said. Industry officials from all three countries are eyeing the deal as a way to seek more regulatory certainty and the harmonization of industry standards, something factored into other trade accords. Canada, for example, may use the negotiations to push for more predictability surrounding the approval of pipelines and power lines crossing into the U.S., following years of squabbling over TransCanada Corp.’s proposed Keystone XL project. Energy companies also are lobbying aggressively to preserve — and even strengthen — the investor-state dispute settlement provisions in NAFTA that empower businesses to challenge other countries for discrimination. Those provisions provide much-needed assurance to companies investing in Mexico today, said API’s Comstock. “We feel this is an important part of the current agreement,” he said. The provisions face opposition from conservationists, who have long said they embolden corporations to attack environmental and public health protections in unaccountable tribunals, with corporate lawyers — not judges — hearing the cases. But the biggest risk may be the Trump administration itself; three energy industry lobbyists said they haven’t confirmed the U.S. position on the issue and are alarmed it’s on the trading block. The lobbyists asked for anonymity as they discussed private deliberations. 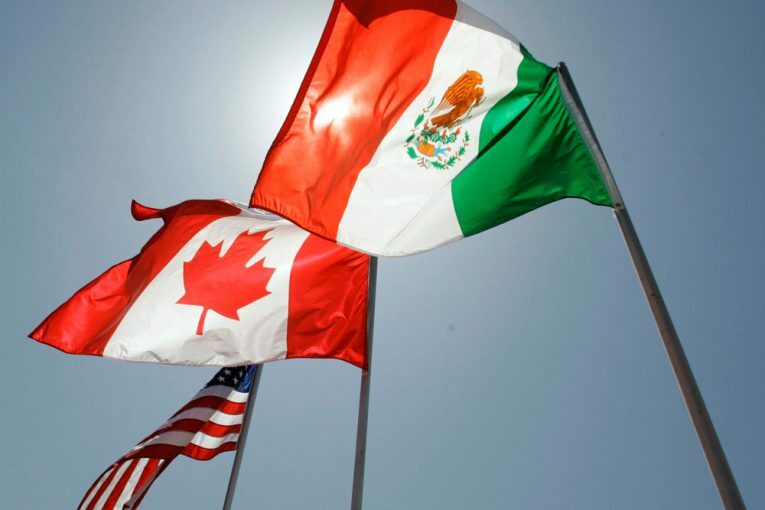 The industry also wants to make it easier to prove products originate in NAFTA countries, arguing the current regime is clunky and outdated — ill-suited for a commodity marketplace dominated by electronic trading and commingled products in pipelines. The current rules “place a high burden on companies to gather and review supplier information — some of which is business confidential and cannot be shared — in order to certify their own goods and obtain duty-free access to markets,” the American Fuel and Petrochemical Manufacturers said in comments filed with the U.S. government. Next : Trans Mountain pipeline route details to be subject of NEB hearings in Alberta, B.C.